In 1921, T.S. Eliot took leave from his banking job and went to the seaside town of Margate in Kent, England. It was meant to be a period of convalescence, but Eliot spent his time working on what would become his most famous work, a long poem called The Waste Land. “On Margate Sands./I can connect/Nothing with nothing,” he wrote. It was published a year later and has inspired countless writers and artists ever since. 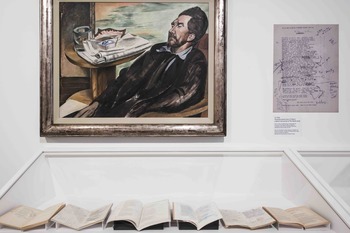 The connection between Eliot’s poem and the art it inspired--and, indeed, the landscape at the root of it all--is explored in a new exhibition titled Journeys with ‘The Waste Land’ that opened earlier this month at Turner Contemporary in Margate. A group of locals who comprise the Waste Land Research Group curated the exhibition. Journeys with ‘The Waste Land’ remains on view through May 7. Images of the exhibition’s installation. Credit: Thierry Bal. In 1921, T.S. Eliot took leave from his banking job and went to the seaside town of Margate in Kent, England. It was meant to be a period of convalescence, but Eliot spent his time working on what would become his most famous work, a long poem called The Waste Land. "On Margate Sands./I can connect/Nothing with nothing," he wrote. It was published a year later and has inspired countless writers and artists ever since. 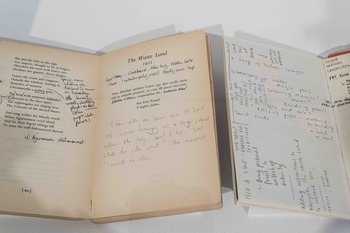 The connection between Eliot's poem and the art it inspired--and, indeed, the landscape at the root of it all--is explored in a new exhibition titled Journeys with 'The Waste Land' that opened earlier this month at Turner Contemporary in Margate. 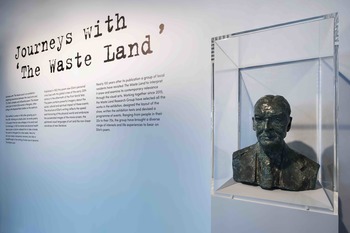 A group of locals who comprise the Waste Land Research Group curated the exhibition. Spotlighting the work of more than sixty artists, including Berenice Abbott, R. B. Kitaj, and Edward Hopper, the exhibition has been hailed as "a lively, imaginative and evocative show that by revelling (just as Eliot did) in the collage of our culture with its vast cast of characters, dense overlay of references and polyphony of voices, captures the atmosphere of the poem to which it pays visual tribute." Journeys with 'The Waste Land' remains on view through May 7. Images of the exhibition's installation. Credit: Thierry Bal.